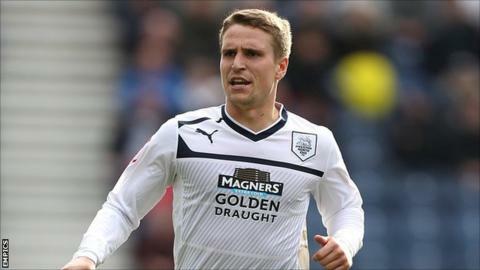 Preston boss Graham Westley praised Nicky Wroe after the midfielder's hat-trick saw off Scunthorpe on Tuesday. Wroe's second goal in the 3-2 win, a controlled first-time finish after he received an awkward bouncing ball, gave Westley particular satisfaction. "Nicky showed great athleticism to get into the box and great quality to finish," he told BBC Radio Lancashire. "The way it bounced, he had to adjust himself. He showed great technical quality to put it into the net." He continued: "Nicky impressed in midfield and the two front boys [Jack King and Stuart Beavon] put in an excellent display." The summer signing from Shrewsbury, 27, has now scored seven goals in 17 appearances since his move to Deepdale. Westley made a change in goal for the game at Glanford Park, with Steve Simonsen replacing Thorsten Stuckmann. And the former Stoke and Sheffield United keeper preserved all three points with a fine late save to deny Scunthorpe striker Leon Clarke an equaliser. "He probably worked harder over the course of the game than he needed to," added Westley. "The team showed good character to deal with the setbacks of the two goals and bring the points home."